Mike Cope’s new book, Megan’s Secrets, is one of the best books I’ve read so far this year. I’ve been friends with Mike for many years and walked a few steps with him in the writing of this book, so I know how excruciating the experience of raising and losing Megan was . . . so re-living it and digging even deeper than he expected he’d have to was also excruciating. But the result of that process of remembering Megan, what she taught Mike and the family, writing and re-writing, is a book that will be a lifeline for many who have gone through similar joy and heartache of living with a mentally disabled child. The experience of raising, loving, and saying goodbye to Megan ten short years into her life is one that taught Mike much of what he now truly believes about God, life, and how we live and die. The book reads like a memoir but doesn’t meander like memoir but drives toward a goal of pouring what Megan taught Mike into the lives of empty vessels who read the book–namely, people who pick up the book will tend to be people who have either gone through similar experiences and become numb in their own grief or exhaustion, or they will be people who have overlooked the little ones like Megan who can teach us so much. As challenging as her decade of life was, our little Yoda instructed us without words, guided us without sentences, and mentored us in the way of God’s peaceable kingdom. Megan became one of those “little ones” who can’t articulate theology but are for us living, breathing icons of Christ’s admonition to take no thought for tomorrow, but simply, in faith, to let each day unfold on its own. Early on, as parents, we often focus on what we might pass on to our children, what we can teach them. As life with Megan unfolded, we learned far more from her than we could ever teach. The first half of the book, focusing on the first two “secrets,” is about the power of her life—a frail, fragile, broken life. The second half pushes further into themes of loss, joy, doubt, faith, grief, and hope. I’ve realized as I’ve written this book that these “secrets” became more obvious as we’ve face other tidal waves of loss. So—what did we learn from Megan? What were her “secrets”? That’s what I want to pass along in this book. 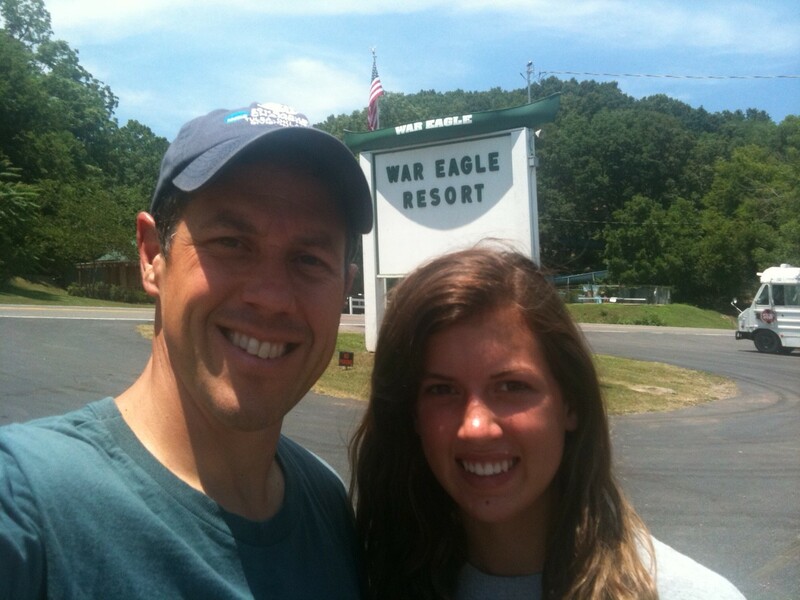 Anna and I at War Eagle Resort where we went on a 12-mile river canoe float. We wondered as we meandered down the river in a canoe together, Why does the state of Oklahoma have an Arkansas River and Illinois River but no Oklahoma River?